Guaranteed departures every TUESDAY, THURSDAY AND SATURDAY! This full day trip from Sofia is an opportunity to discover one of the oldest European towns contemporary to Troya and Mikena – Plovdiv as well asmedieval Assen Fortress. This beautiful fortification will allow you to learn some history and take wonderful pictures on the green mountain of Rhodopes. Guaranteed departures every Tusday, Thursday and Saturday, even for one person only. English speaking guide throughout the full day. Personal attention guaranteed! Entrance fees (Plovdiv museums 6 BGN per museum or 15BGN for all and Assen Fortress 3BGN). Plovdiv is not only one of the oldest European towns contemporary to Troya and Mikena but it will be the European Capital of Culture in 2019. It has existed as a settlement for 8000 years and became a town some 3000 years ago during the Troyan war. In 342 BC, it was conquered by Philip ІІ of Macedonia, Alexander the Great’s father, who renamed it Philippopolis or "the city of Philip" in his own honor. With the establishment of Bulgaria in 681 Philipopolis became an important border fortress of the Byzantine Empire. In 1364 the Ottoman Turks seized Plovdiv and called the city Filibe which comes from "Philip". In the historical heart of the city you will see beautifully decorated 19th century houses, the ancient fortress wall, the Roman Forum and Stadium as well as magnificent churches. The wealth of the city of Plovdiv is its museums, antic historical sites, ancient houses and paved streets. Asen Fortress is a beautiful medieval fortification part of the tragic periods of the Bulgarian history. 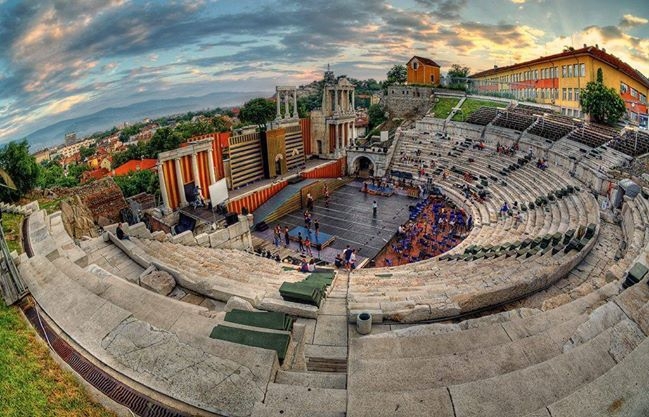 Start: 9:00h a.m. / End: 6:00h p.m.
At about 11h a.m.you arrive in the center of Plovdiv and start toward the old town on cobblestone streets where you will visit some houses, the church, the Roman Theater and Stadium. In the beginning of our walking tour we can stop in an old house, where you can try local production of alcohol drinks and rose oil products. This 2 hour guided tour in English will take you to the main square of Plovdiv. 12:30h and 2:30h p.m. you will have free time to explore the commercial part, have lunch or coffee along the main pedestrian street. At 2:30h p.m. you will meet your van and guide at the end of the main street in front of Ramada hotel for your 30 min drive to Assen Fortress. This beautiful medieval fortification will allow you to learn some history and take wonderful pictures from the top. At 4:00 h p.m. your tour will be over and you will start your journey back to Sofia with an expected time of arrival at Alexander Nevski Square in Sofia around 6:00h p.m. Bookings made for the following day must be confirmed by e-mail or telephone in person. We will do our best to accommodate last minute bookings, however we cannot guarantee seats / vehicles available for the next morning. Driving time: 4h 30m approx.